Pregnancy massage is a wonderful way to support the well being of both you and your growing family and I believe it should be at the forefront of antenatal care. Whilst relaxation is always welcomed, you may also need gentle relief from the common discomforts of pregnancy such as headaches, back pain, sciatica, swollen ankles, and pubis symphysis dysfunction. 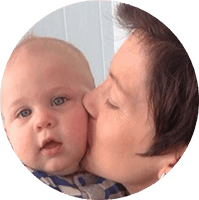 You want an experienced therapist who knows what it means if you have gestational diabetes or pre- eclampsia, and who can help empower you in your pregnancy. A pregnancy massage will leave you feeling not only pampered but help alleviate any pain you are experiencing. A soothing blend of grapefruit and mandarin oils are used for their extreme gentleness, while calendula, shea butter and jojoba oils nourish stretching skin. This massage is suitable during all stages of pregnancy, and is carried out in the side-lying position with lots of pillows and bolsters for added comfort. Gift Vouchers are available on all treatments.